Jamaican economist Trevor Alleyne will be the IMF's representative in Buenos Aires, as organisation returns to Argentina, six years after leaving. 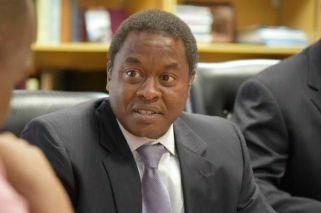 The International Monetary Fund has announced that Jamaican economist Trevor Alleyne will be the institution's representative in Argentina, after confirming it had decided to reopen an office in Buenos Aires, six years after leaving. The decision comes after Buenos Aires reached a deal with the IMF on the money supply, interest rates and an exchange rate framework. In exchange for these measures, the Fund agreed to speed up payment of a US$57.1-billion loan granted in June to Latin America's third-largest economy, now in another economic crisis. Alleyne, an IMF staffer since 1992 with more than a quarter of a century's experience with the organisation, will be the Fund's representative in Buenos Aires. He has previously overseen IMF missions in countries such as Nigeria, Zambia, Jamaica, Peru, Venezuela and Ecuador. According to the Noticias Argentinas news agency, Alleyne will serve as the Fund's "resident representative" in Argentina, becoming the first point of contact between the IMF and the Argentine government's economic team. The IMF will, at least for now, be based inside an office at the Central Bank, the agency said. The IMF has offices in around 70 countries.